Storage devices aren’t often stylish and funky when it comes to shape and design. Instead they’re usually a plain-coloured and don’t feature any unique textures or patterns unless the logo is extremely creative. 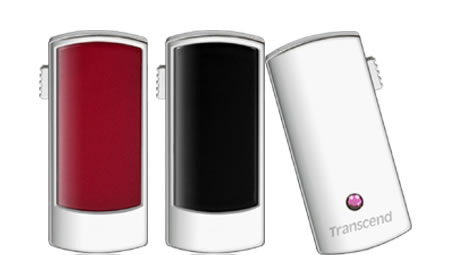 However, Transcend has introduced a USB flash drive that you may just want to show off to friends. The Transcend JetFlashV95 is a sleek ultra-compact USB flash drive that has a 4GB memory capacity. The device features a glossy look and shiny chrome casing along with a magnificent precision-cut rose crystal. Even though it’s very attractive, the JetFlashV95 does do its job. Users can download and install the company’s useful JetFlash data management tools on the drive itself to help improve mobile productivity. The tools can help turn the flash drive into a key to automatically log onto a website or into a safety device that locks the computer to prevent unauthorized access. Available in two colours (Onyx Black and Satin Red), the USB flash drive is ideal for individuals who are constantly on the go and need to carry a lot of data. With a retractable USB connector and leather carrying strap, it can add a lot of style to an individual’s gadget collection. To find out more about the JetFlashV95, you visit Transcend’s website.